Yesterday was our wedding anniversary, and to celebrate I made these Peanut Butter Cup Cheesecakes. You see, cheesecakes hold a special place in our hearts because that is what we had for our wedding cake. So they make a frequent appearance in out house, especially for special occasions. Not only did we have cheesecake at our wedding, but my mom and I made them. All of them. For each table. Count ‘em – 27 cheesecakes! And then to add another layer of stress, I wanted three different flavors because I wanted everyone to be happy. So we had Oreo Cheesecake, White Chocolate Raspberry Cheesecake and Key Lime Cheesecake. If you wanted a different flavor then the one on your table, you had to try and get some from another table. And what I learned was that some people don’t share very well! 🙂 But people are creative and passionate about their cheesecake, and they found a way to get what they wanted. Even today, friends still remind me of their cheesecake negotiations when talk of weddings comes up. 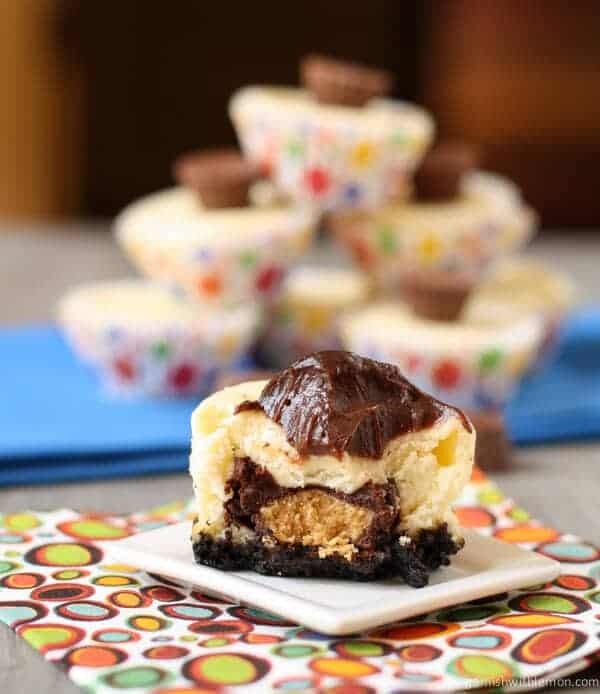 So back to these Peanut Butter Cup Cheesecakes. I am a fan of pretty much anything chocolate and peanut butter flavored, but peanut butter cups are one of my all-time favorite candies. I cannot have them in the house, otherwise I eat them all. I don’t always share very well, either. Hmmm, see a trend? 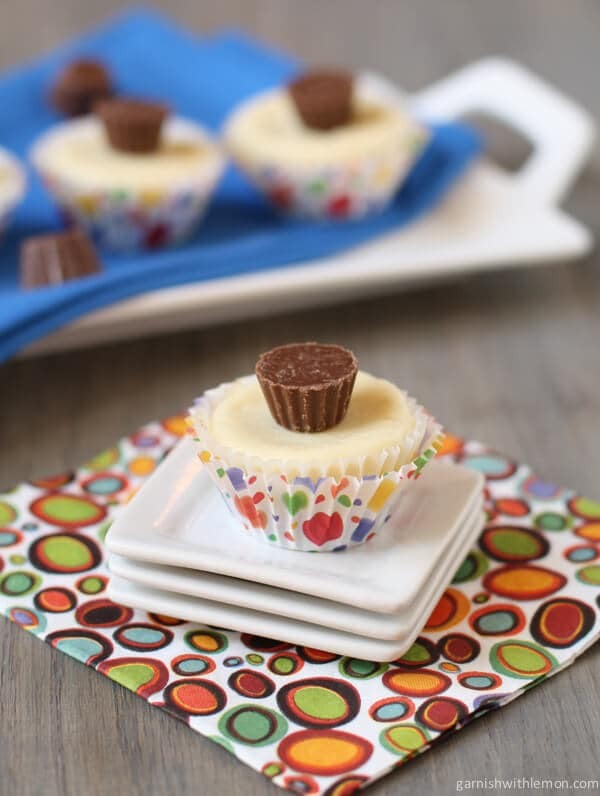 These Peanut Butter Cup Cheesecakes are super easy, and I love that they are individually portioned so there is no need to worry about sharing. And in each bite is a bit of peanut butter cup. Does it get much better than that? Creamy cheesecake with an Oreo crust AND a peanut butter cup. I’m in cheesecake heaven. A creamy cheesecake filled with a peanut butter cup. Mix oreo crumbs and melted butter until well incorporated. Place 1 tablespoon of Oreo mixture in bottom of each cupcake liner and press down to pack crumbs in bottom. In the bowl of a stand mixer, beat cream cheese and sugar until light and fluffy. Add, cream, flour, and vanilla, and beat well. Add eggs, 1 at a time, beating well after each addition. Place peanut butter cup on top of crust and spoon one tablespoon of cheesecake filling over top. Bake in preheated oven for 12-15 minutes or until cheesecake is set and toothpick comes out clean. Chill for 2 hours and serve. Top with hot fudge if desired. I’ll be making these very soon, thinking Labor Day Weekend and Hawkeye tailgating, people will love these after brats and burgers. Especially my Father-in-law. What a gorgeous little cheesecake! It has all my favorites in one glorious bite!! !